The world of chocolate is one sharply divided by hierarchies of cocoa content. I must solemnly confess that I have long harbored a prejudice against white chocolate and, by extension, consumers of white chocolate. Perhaps this distaste developed in response to the cloyingly sweet white chocolate Easter confections of my youth, or as a natural extension of a passion for dark chocolate. Why sully such perfection by removing cocoa content? However, when author Jennifer Doody told me — at our first face-to-face meeting, while she sipped on a white hot chocolate (gasp!) — that she was a fan of the ivory colored stuff, I was first shocked and dismayed, then deeply fascinated. Please teach me more about your kind, I implored! Her response is below. And I ask you, fellow lovers of chocolate, what do you think? Several years ago, a close friend and I were musing about one of our favorite things. “What type of chocolate do you like best?” she asked warmly. I didn’t hesitate. “White chocolate, definitely,” I said. She stared at me in disbelief and then uttered a sentence I’ve heard many times since. “That’s not chocolate,” she huffed. I was taken aback. Of course it was chocolate: it said so on the bar! But alas, no amount of marketing citations or arguments would sway my friend. The fact that white chocolate contains cocoa butter, but not cocoa solids, was irrefutable evidence against white chocolate’s inclusion in the world of Real, Actual Chocolate. Ever since that exchange, I have had to come to a brutal realization. Despite my love of the German chocolate of my youth, I simply am not a cocoa snob. That’s not to say that I don’t appreciate fine chocolate. I do. But when friends discuss the eloquence of cacao nibs, wax rhapsodically over a newly discovered delicacy with an enormously high cocoa content, or rave about semisweet, bittersweet, or super dark chocolate… my eyes glaze over. Just the tiniest bit, mind you. But enough for me to know, deep down in my bones, that I’m afraid of being found out; I fear that my love for the sweet, creamy texture of white chocolate will render me an outcast among my fellow chocoholic friends. So what is at the center of the controversy? How can such a sweet, ivory treat generate such division among friends? For those opposed to white chocolate, it primarily has to do with how the composition and creation of white chocolate differs from that of other chocolates. HowStuffWorks provides a clear, layperson’s explanation of the chocolate production process. In a nutshell, cacao nibs are separated from the shells of roasted cacao beans, and then ground into a brown paste called cocoa mass. Cocoa mass is then heated and melted to become chocolate liquor – a slight misnomer, as the liquor is not alcoholic. Here’s where it gets interesting, because one of two things can be done with chocolate liquor. First, it can be molded and cooled into hardened blocks. This process results in unsweetened chocolate, which most of us know as unsweetened baking chocolate. Chocolate liquor alone can be quite bitter tasting, so chocolate makers often combine it with a variety of delicious products, such as sugar, powdered dairy, vanilla, or other flavors. Another option for chocolate liquor, however, is to “press it in a hydraulic press to squeeze out the fat. When you do that, what you are left with is a dry cake of the ground cocoa bean solids and cocoa butter.” Cocoa solids go on to become what we know as cocoa powder. It is the latter product, the cocoa butter, the fat of the cacao bean, which goes into white chocolate. Cocoa butter is a rather magical substance. Renowned for its stability and texture, it possesses natural antioxidants, which help maintain its storage life for multiple years. Its luxurious feel, mild chocolate fragrance, and emollient properties make it a popular ingredient in cosmetic products, including skin creams, soaps, and makeup. Because it is nontoxic and melts at body temperature, it is also used in the pharmaceutical industry as an ingredient in suppositories and oral medications. 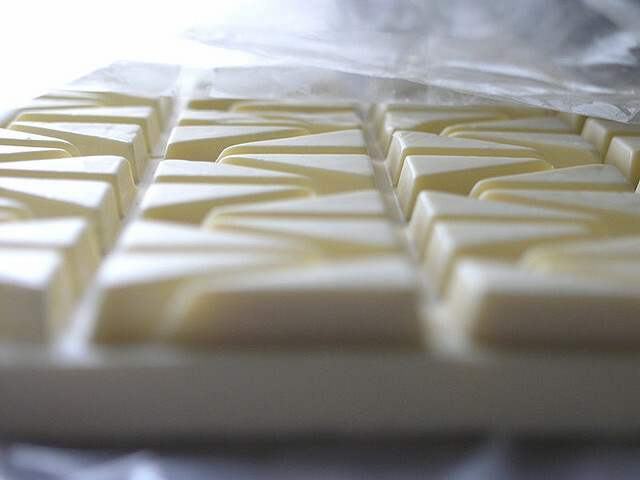 For our purposes, however, cocoa butter plays a crucial role in the making of white chocolate. White chocolate makers combine cocoa butter, a sweetener – usually sugar, though other sweeteners are increasingly common – as well as powdered dairy or a nondairy alternative, and vanilla. Various other ingredients can also be added, such as fruits, nuts, or herbs. Purists and nibs connoisseurs will cry foul. Nay, they will proclaim, only the almighty cocoa solids can bestow the glorious title of chocolate upon a product! The bitterness of dark chocolate only further affirms me as a chocolate fanatic! My zeal for the meat of the cocoa bean cannot be undermined or besmirched! And to those fine, passionate people – many of them dear friends of mine – I can only nod and say, of course. As you will. Carry on. It just means there’s more of my beloved white chocolate for me. Jennifer Doody is a writer with 20 years experience in university news, communications, and academic editing, based in Boston, Massachusetts. Visit her professional site here to read more of her work. White chocolate is too sweet for me, and the flavor/smell doesn’t appeal to me at all. I think working at Burdick’s and inhaling it from the giant vats of shaved chocolate ruined it for me. However, I recently had white chocolate/miso ice cream at Craigie street and thought the combo was pretty cool. When I was about fifteen, I had some homemade white chocolate at a small town harvest festival (the annual Grange Fair in Glastonbury, Connecticut), that made me a fan for life. That experience set a very high standard, however, and I have rarely found white chocolate that matched my memory of that wonderful white chocolate. But the search for excellent white chocolate over the decades has been enjoyable, even though most commercial varieties (even Godiva) simply are not quite good enough.